I’m unsure what to make of the latest happenings surrounding Kime Hut. This Saturday the TTC  had been planning to host its own “opening ceremony” at the hut. If you haven’t heard, however, the TTC has been forced to abandon that ceremony because the hut is about to be locked. This comes nine months after the hut was all-but-completed, and nine months after people began using it unofficially, but the hut was never officially opened . 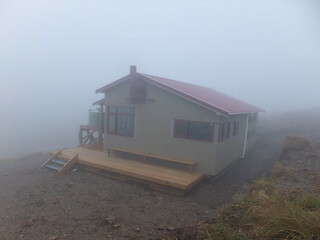 Kime Hut III, in October 2013. The reason? Kime Hut 3 hasn’t yet obtained its Building Certificate from the Kapiti Coast District Council. DOC has finally decided that it can’t legally allow people to use the hut until the Building Certificate has been issued, to the extent of needing to lock the door to keep people out. Kime Hut is one of the more important huts in the Tararuas, both historically and also for its function. Since the hut’s inception it’s been used as an ad-hoc ski lodge, a stop-over point for many people walking the Southern Crossing and the Main Range, and also as a refrigerator. The exposure and cold of that region of the Tararuas means it’s not always the nicest place to spend a night, but on so many nights, and days, it’s far better to have a reliable hut with an inside that protects from chilling gale-force winds than it is to be stuck outside. More than a few people have also died in the vicinity through exposure to the elements, or come close to it. The most recent deaths occurred in the winter of 2009 . Many more people have doubtless avoided a likely death by having the hut there as a refuge when plans went bad. It’s all very well to tell people they should plan and prepare properly, make good decisions and bring adequate shelter. I do this from time to time , as I strongly believe that it’s important to always plan for the possible outcome of not arriving at a hut. In the end, though, things still go wrong, or sometimes people simply don’t prepare as well as they should. 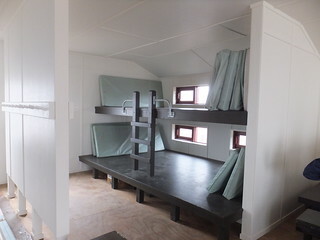 Kime Hut is a classic example of a New Zealand back-country hut which was purpose built on a premise of making the area more safe for trampers, and it truly does save people’s lives. The first hut near the site—the Hector Dogbox—was built in 1922 as a direct response to the death of Harold Freeman. Construction of the Hector Dogbox wasn’t finished by the time Esmond Kime died in June of that year, after he and his friend Allan Bollons were forced to turn back towards Alpha Hut . Mr Kime was exposed in tussock, sheltered off the side of the ridge for a whole week, within 20 minutes of the top of Mount Hector. He’d developed what’s now known as hypothermia and despite being alive when found, nobody knew how to treat it at the time and he eventually died after rescuers had carried him to Alpha Hut. When the Hector Dogbox was destroyed in a gale of 1928, the first incarnation of Kime Memorial Hut was commissioned on the current site. It lasted until the 1970s when it was replaced with Kime Hut 2. That hut was eventually dismantled in 2013 with an intention of a speedily built replacement, but now leaving us with the current problem. I won’t dwell on the details of what’s actually going on behind the scenes here, or why it’s taking so long for Kime 3 to be opened. I don’t know enough about it, except that the situation has more than one side to it, and I’d prefer not to get things wrong and will offer the benefit of the doubt at least until details emerge. I really hope this gets fixed soon, however. The lock on Kime Hut’s door needs to be removed again. Until February of 2013, there was an actual functioning back-country hut in the vicinity. Since three months after that time there’s been a replacement which effectively does the job even if not officially ready. It’s been available as a life-saving refuge from the elements during poorly planned trips, and also for people who simply made a mistake and got caught out. Now, for the first extended amount of time in 94 years, there is no fixed safety refuge for people who discover they need it. You can check the current status of Kime Hut on DOC’s web-page for the hut . Reportedly there may be a key in a smashable box, for opening the door in emergencies, but don’t assume this is so. 3 Comments To "The Downs and Ups and Downs of Kime Hut"
It is good to read Mike that you have not made any assumptions and criticism of certain people/organisations as others have to date. The builders have received most of the blame for the delays on completion, which has been hugely misunderstood. The hut was 90% completed in April 2013 before early extremely heavy snow and ice stopped the last work being carried out. Upon inspection, it was observed that there was a problem with the window flashings design (which were already installed as per plans). After consideration from the architect – new details (without council approval) were issued and the builder was to re-install new flashings to comply with the new drawings. This work was carried out along with the finishing touches in late November 2013. Council signed off the work onsite pending official detail changes from the architect, as what was installed were now different than what was shown on their approved plans. The remaining hold up to the sign off was the decision about the soffit flashing – which was not installed but the building code, roofer and council inspector all agreed was not necessary. The builder was prepared to go back to site immediately to install this flashing but DOC took until March to instruct them to do so, as soon as they did – the builder was back onsite and the flashing was installed before the end of March along with some painting touch ups as part of the maintenance commitments. Its clear that there is truth in the reports that their may have been inexperience on the builders end – but who does have experience building a hut at 1400m rated to 300km/h winds and heavy snow loadings and down to -15 degree building conditions at times?? Its fair to say that the architect, media and DOC have conveniently blamed the builder – but hopefully those that read this will no know the facts (in brief detail). PS The hut was never locked, there was never a smashable box with a key in it, and the reality was – the hut was actually signed off by KDC in November pending documents from the architect so the hut was always safe to be used, and was used by everyone that came up from April 2013 onwards. KDC were never at fault and always carried out their commitments and in no way delayed the signing off of the hut. Hi Troy. Thanks for that insight. I heard that there was no smashable box in the end, very fortunately, but I did hear from one source (which I thought I had reason to believe) that the situation really did come very close to the hut being locked by DOC. At the time, the whole thing sounded to me as if someone up the management chain might have panicked upon hearing about the TTC’s informal opening ceremony and then finding out why it wasn’t really open. That’s just a guess, though. DOC has now said it will not lock the door of Kime Hut: http://www.stuff.co.nz/national/9804851/Tararua-hu..